Big Bend. Set in a quaking aspen and Jeffrey pine forest alongside Lee Vining Creek, Big Bend is a perennial favorite of Yosemite veterans. It’s just 9 miles from the park’s eastern boundary. 17 sites late Apr-Oct 31; $17. Inyo National Forest, www.fs.fed.us/r5/inyo or 760/647- 3044. Ellery Lake. The granite-backed lake surrounded by jagged peaks lies 3 miles west of Yosemite’s eastern border at an elevation of 9,500 feet. The best sites are set off from the main camp by a short walk. 21 sites May-Sep; $17. Inyo National Forest, www.fs.fed.us/r5/inyo or 760/647- 3044. Saddlebag Lake. At 10,087 feet, the location’s a major entrance point for the 20 Lakes Basin, a favorite hiking and angling area. And it’s only 5 miles outside Yosemite’s eastern boundary. Sites 16 and 18 have a lake view to die for. 20 sites Jun-mid-Oct; $17. Inyo National Forest, www.fs.fed.us/r5/inyo or 760/647- 3044. Sawmill. 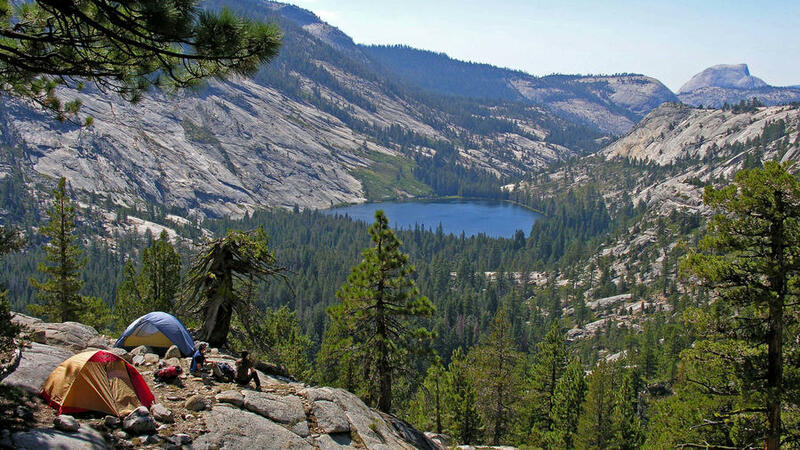 Each campsite has a drop-dead gorgeous view of the High Sierra- mountain peaks, a subalpine meadow bisected by a rushing stream, and scattered whitebark pines. If there’s camping in heaven, this is what it looks like. 12 sites May-Sep; $12. No RVs; no running water. Inyo National Forest, www.fs.fed.us/r5/inyo or 760/647- 3044. Summerdale. Located 1 1/2 miles from Yosemite’s southern entrance, Summerdale is set at 5,000 feet in elevation on Big Creek. Many campers spend summer afternoons cooling off in the creek’s deep, clear swimming holes. 29 reservable sites Jun-Nov; $17. www.reserveusa.com or 877/ 444-6777. INFO: Seven-day pass $20 per vehicle. www.nps.gov/yose or 209/ 372-0200.